10 A . M . - 2 P. M .
R A I N O R S H I N E! The market began back in 1994 when a group of residents and business people organized with the goal of creating a venue to promote Hudson Valley agricultural products and to enhance the social and economic vitality of the Town and Village of Rhinebeck. The market has since evolved into something greater. It has become Rhinebeck's Sunday morning gathering place. A place where neighbors meet and mingle and visitors can sample the very best of the Hudson Valley. Our vendors provide a diverse and unique selection of farm fresh products including fruits and vegetables, beef, pork, lamb, venison, buffalo, fish, chicken, turkey, duck, pheasant, rabbit, eggs from chicken, duck, turkey and pheasant, goat, cow and sheep's milk cheeses, dairy, honey, juices, jams, flowers & plants, smoked products and much more. The Rhinebeck Farmers' Market is unique in that it is not supported by a civic or governmental organization and enjoys no special eligibility status. The market relies solely upon vendor fees, business sponsors, donations, volunteers and merchandise sales for its operating funds. To learn more about becoming a sponsor, click on sponsor. In 2010, the Board of Directors was pleased to announce the John Honey Scholarship, named in honor of founding member on the Board of Directors, John Honey. An award is given to a graduating High School senior, a current college student from the local area or a student who is the child of a Rhinebeck Farmers' Market vendor majoring in agriculture, food science, environmental studies or a related field. Scholarship funds are also provided to current vendors pursuing continuing education. 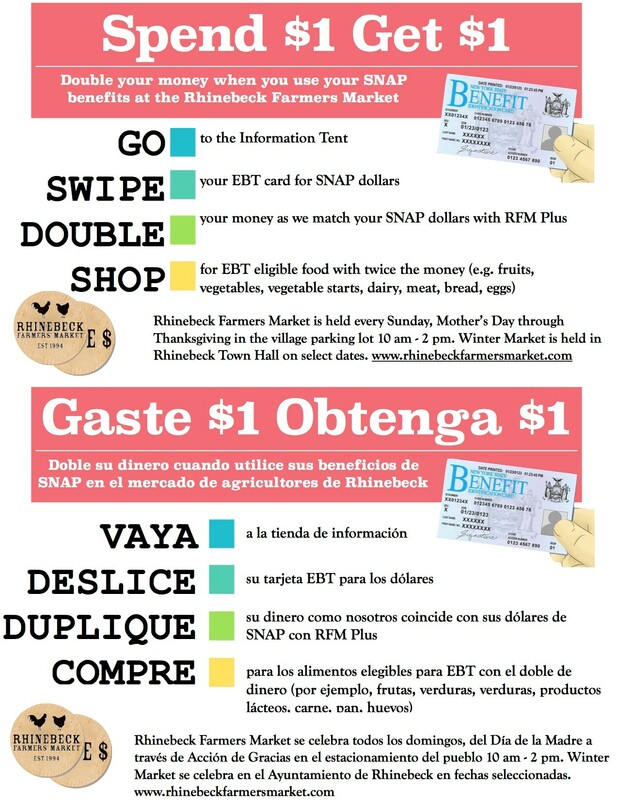 Farmers' Market Nutrition Program, Fresh Connect, and EBT/SNAP are accepted. In 2017, the market launched the SNAP "Plus" program. For every $1 of SNAP benefits redeemed, the market will match your spending with a $1 Plus token. For health and safety reasons, pets are not permitted in the market. Service dogs with tags and documentation are permitted.